Officials from the FBI, DEA, ICE and a number of local police departments say they apprehended the ring leaders of major drug trafficking organization. Three Dominican brothers and a dozen other people have been arrested in New England as part of a federal investigation into alleged cocaine, fentanyl and heroin trafficking. 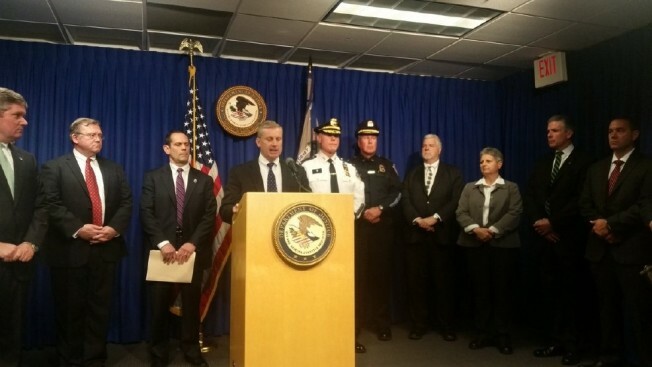 The U.S. Attorney's office said Thursday that the suspects ran a Rhode Island-based trafficking organization that imported drugs from Mexico and supplied them to street-level dealers in greater Providence, greater Boston and Connecticut. Brothers Juan Valdez, 50, of Milton, Massachusetts; 47-year-old Hector, and 44-year-old Claudio, both living in Woonsocket, Rhode Island, have each been charged with conspiracy to distribute drugs and unlawful use of communication facilities to commit drug-related offenses. They're also being charged with illegally returning to the United States after being deported to the Dominican Republic. Twelve other people also face drug-related charges. During the course of the investigation, which began in September of 2016, the FBI seized nearly four kilograms of heroin, 1.5 kilograms of fentanyl, two kilograms of cocaine, 155 grams of crack cocaine, more than 100 pounds of cutting agents, 12 kilograms of powdery substances that are still being analyzed, about $95,000 in cash and nine vehicles. Five of the vehicles had hidden compartments allegedly used for transporting drugs and money. "As alleged, the Valdez brothers trafficked in all types of drugs and profited from the addictions that have destroyed lives and torn apart families here in New England. This case illustrates that drug cartels based in foreign countries will go anywhere to distribute their deadly products,” said Harold H. Shaw, Special Agent in Charge of the FBI Boston Field Division. “The FBI’s Safe Streets Task Force will do everything it can to disrupt and dismantle drug trafficking organizations that threaten the safety and stability of our neighborhoods." The federal public defenders' office, which is representing the Valdez brothers, didn't immediately return a call for comment.